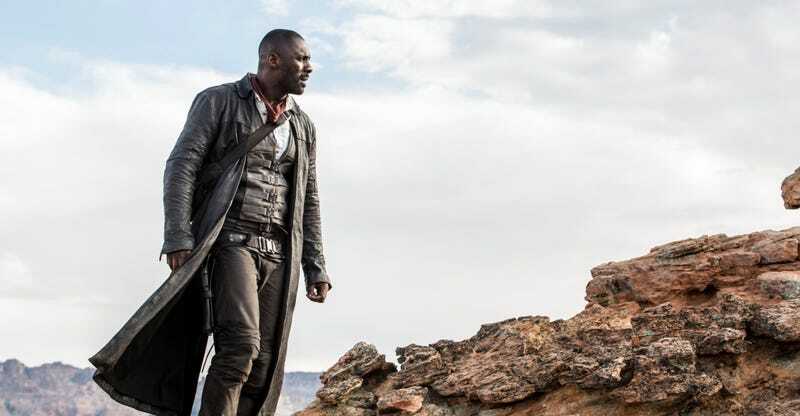 The Dark Tower will hit theaters in July but a trailer has yet to be released. Well, that changed at CinemaCon 2017 where Sony showed about four minutes from the film—a featurette leading into a trailer and an extended scene. Here’s what happened in the footage. Now into the trailer, which starts with Jake having dreams. He’s in bed but his whole room shakes. Next, he’s talking to a psychologist about the dreams. As he tells him about the other worlds he dreams of we see Jake in his room with a huge wall of drawings of all kinds of things from The Dark Tower series. In the psychologist’s office is a photo of the Overlook Hotel. Jake has a feeling that he needs to go into a house in New York. We know this as Dutch Hill Mansion from the third book of the Dark Tower series, The Waste Lands. But unlike how it plays out in the book, Jake walks into the house and simply and calmly finds a portal. He jumps through the portal and boom, he’s in another world. In this vast, desolate world, you can see two or three planets on the horizon, extremely close. Roland finds him and Jake knows who he is. He even has a drawing of him. He’s dreamt of the Gunslinger before. Next we see Jake and Roland walking past what looks like a pile of debris in the shape of a spaceship. Jake asks Roland about the Man in Black: “Is he like the devil?” “The devil is a dog he would kick,” says Roland. We see the Man in Black run his hand over a man’s face and kill him. Now we kick into a montage. Lots of action here, most of which involves lots of Roland shooting his guns, which, at one point, have sections that are glowing blue. He loads the guns incredibly, incredibly quickly and his belt is lined with magazines of bullets. We see Roland jumping through the air shooting. Next, he shows down in a hallway with the Man in Black. Roland shoots glass above him, but the Man in Black stops it and shoots it at Roland. Roland then runs and slides on his knees under it the glass. That’s where the trailer ends but things continue. We see a town under siege. Maybe it’s Tull. Maybe it’s the Callas. We don’t know. What we do know is something evil takes Jake in a city that’s burning all around. As Jake is dragged off by this mysterious villain, Roland waits. He listens. He hears a drop of blood. The clank of a wrench. He then lifts his gun and, without looking, fires. The bullet flies through a window, some clothes, and bam! Right into Jake’s captor. That’s where the footage ended. It looked like a huge amalgamation of all of Stephen King’s books with plenty of original story worked in. This is not a straight adaptation. No, it’s a new take on this story. Almost an alternate dimension. And while fans of the books may be upset at the changes, the film has a certain epic, mythical look. The Dark Tower is scheduled to open on July 28.